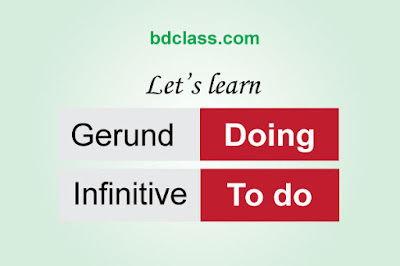 Gerunds and infinitives are very common in the English language. We use them in many situations. Sometimes, we can use both of them in the same situation, sometimes we must use only a gerund and sometimes only an infinitive. If we use gerund form in the place of infinitive form, it is wrong. A gerund is a form of any verb when we use it as a Noun and in the same time as a Verb. Kamal: What do you love doing? Now, I'll discuss 5 situations where you should use a gerund. Gerunds and infinitives can replace a noun in a speech. Walking is good for our health. Making friends has become more difficult since I moved to a new college. Both Gerunds and Infinitives can be used as objects of a speech. Today, I decided to draw. The gerund is used after some verbs: stop, start, enjoy, discuss, postpone, fancy, dislike, mind, suggest, admit, finish, recommend, avoid, appreciate, complete, consider, miss, practice, risk, busy, keep, avoid etc. Avoid: He avoided looking me in the eye. Consider (think about): I considered taking silent, but I had to tell her. Deny: I denied knowing about his secret. Involve: The course involved writing three tests. Mention (say something): She mentioned seeing my brother at a baseball game. Recommend: I recommend practicing gerunds and infinitives. Risk: Don’t risk losing your job! Suggest: I suggest reading more English short stories. I made dinner before getting home. He looked unhappy after seeing his work schedule. He looks forward to meeting his cousins. Now, what if I ask you what you want to do a holiday? Maybe you are learning to draw. Else you want to do is to read storybooks. Or maybe you are planning to start your own business. These are all samples of infinitives. In that case, we used infinitives to describe them. Now that you know the difference between gerunds and infinitives. Our some simple rules are sure to help! Let’s start with explaining what gerunds and infinitives are. After Objects: Infinitives are used after sentence objects that are nouns or pronouns referring to a person. We asked her not to go. agree, ask, decide, help, plan, hope, learn, want, would like, promise, claim, desire, afford, allow, intend, manage, deserve, know, pretend, need, offer, try, refuse, prepare, learn, wish, fail, seem, promise, want. Agree: I agreed to go to a party with my friend. Decide: The president decided not to participate in the discussions. Deserve: Everyone deserves to be respected. Expect: I expect to know my exam grade by tomorrow. Hope: We were hoping to avoid traffic by leaving early. Learn: He learned not to trust anyone. Need: She needs to learn how to cook. Offer: I offered to help my brother with homework. Plan: We are planning to watch a movie tonight. Promise: My friend promised to find the time to help me move. Seem: We seem to be lost. Wait: I cannot wait to see my family. Want: I don’t want to go to bed yet. There are lots of verbs that require an infinitive after. You will learn them naturally, as you progress in your English studies. It is hard to make dinner this late. I find it difficult to describe my feelings about writing research essays. I left for Russia to study Russian. I came to the office to solve the mystery of the missing keys. Maybe Gerunds and infinitives are confusing but they make your English speech more elegant and colorful. It is very necessary to study them and practice using them correctly. The more you notice them (gerunds and infinitives) in your study of the English language, the easier it will get! Sometimes you will be unsure if you need to use an infinitive or a gerund in a speech. In that case, try to change the sentence and saying what you want to say in a varied way.